In a large saucepan, heat 1 tablespoon EVOO, one turn of the pan, over medium heat. Add the rice and toast until light brown, about 4 minutes. Stir in 2 1/2 cups stock and bring to a boil, then lower the heat to medium-low, cover and cook for 15 minutes. During the last 3 minutes of cooking, stir in the peas and cheese. While the rice cooks, in a large skillet, heat the remaining 1 tablespoon EVOO, one turn of the pan, over medium-high heat. Season the chicken with salt and pepper, add to the skillet and cook until the juices run clear, 5-6 minutes on each side. Transfer to a plate and cover with foil to keep warm. Melt 1 tablespoon butter in the skillet, then whisk in the flour and cook for 1 minute. Whisk in the apple cider and the remaining 1 cup chicken stock and cook until slightly thickened; season with salt and pepper. Remove from the heat. While the chicken cooks, in a large saucepan, bring 1 inch of salted water to a boil. Add the green beans and cover and cook to al dente, about 3 minutes. Drain the beans and return to the saucepan. Toss with the remaining 1 tablespoon butter and the scallions; season with salt and pepper. Pour the apple gravy over the chicken and serve the rice and green beans alongside. In Recipes-list.com we have selected the most viewed recipes from category - uncategorized . Enjoy the best recipes specially selected for you! 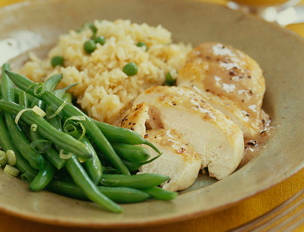 Chicken with Apple Gravy, Rice Pilaf and Green Beans is the right choice that will satisfy all your claims.